Reaching legendary status in music is predictably difficult because of its unpredictable nature. NWA may not have been the first group of its kind, but it certainly was the group that did it best. Their anger and outrage reverberate from the speakers and through the decades, echoing their message of racial inequality and protest towards a corrupt system that appears to still exist today. Their social and political message helped fuel a nation that was tired of being treated like second-class citizens. Even in death, a member lived on to be a cautionary tale and catalyst for change with a virus that was as deadly as the stigma was social. The lasting effect in society is how you become a legend, and for NWA it all started with their first album, Straight Outta Compton. Straight Outta Compton has a message for those willing to hear and see it. It’s a message about change and protest, even in the face of death. Regrettably, halfway through the film it feels as though its spirit has changed, and we find ourselves meandering through the second half. The powerful message that was at the forefront of their music is now relegated to background television chatter, drowned out by petty personal squabbles. Maybe it reflects a wider change that society insidiously went through around that time, moving from a sense of community in a shared struggle to a greater focus in self-preservation and self-interest. Either way, the dynamic energy of the film slows to a reflectionary amble as each person realizes their mistakes and the film reaches its inevitable end. Director F. Gary Gray wants us to remember the socially conscious super-group known as NWA and how their battle for social, political, and economic equality is still one going on today. Through the film, we are given their origin story in an attempt to inspire the masses to return to a fight that has been going on for decades but which is especially prevalent now. The only problem inherent in showing the rise of NWA is having to show its eventual downfall, which proves to be much less socially relevant and more emotionally stagnant. Gray brings to life the raw, emotional aggression from NWA’s music and contextualizes it for those who didn’t know the source of their anger. We are made to feel that anger because we are made to realize that we have not come far enough to stop the militarization of police and their vicious brutality. Every emotional cue would be missed if it weren’t for the amazing cast, especially O’Shea Jackson Jr. (who played his father, Ice Cube) and Jason Mitchell (who played Eazy-E). These newcomers have proven they can hold their own next to heavy hitters like Paul Giamatti, who plays their manager Jerry Heller. The authenticity of the story, or whether any of it was fabricated or exaggerated, is never in question, thanks in big part to the genuineness of the performances. Giamatti just might have a future in playing dubious music managers, much like he did earlier this year in another music bio-pic called Love & Mercy. As for the rest of the cast, I can guarantee we haven’t seen the last of them. On top of the story and the great performances, Straight Outta Compton would have fallen flat (or sharp) if the incorporation of the music was not perfect. Luckily, that aspect of the film was flawless. Much like Love & Mercy, Straight Outta Compton didn’t just throw tracklists of songs at us just to appease. Instead, they were intricately woven into the story, given context and a backstory. The film excels at showing us the influence and birth of their most popular songs, adding a further melodic layer to their already storied hits. They do this to a lesser, but still enjoyable, effect with collaborations that are happening around the time frame the film takes place. Through this, we get introduced to Tupac, Snoop Dog, and foreshadowing for Dr Dre’s colossal album, The Chronic. There are event moments of humor that play with this concept, showing Ice Cube working on his script for Friday and giving us the foundation for his “Felicia” character. 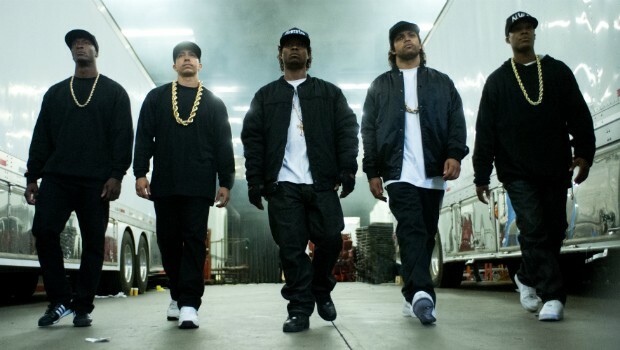 If Straight Outta Compton had remained parallel to recent events, it would have continued to be consistently engaging. Unfortunately, the film loses its momentum, and with it, the mirror to society’s current state. It feels like the film is more interested in showing the life (and sometimes death) story of the group’s members, with the compelling comparison in the first half of the film as a close secondary effect. By the end of the film, you see a montage of how successful the surviving members of the group are and realize the true intention of the film might be more self-promoting than enlightening. At that point, it’ll matter little, because even that doesn’t undo how entertaining the film has been. The only thing you’ll remember is the anger towards the still-present and rampant cases of police brutality, all while humming along to your favorite song that was shown. Previous ArticleTV Throwback Review: Party Down (1x03) "Pepper McMasters Singles Seminar"